Do you make to-do lists that keep getting longer instead of shorter? Do you lose the lists, or tackle every task you can think of except the ones on your list? It’s time to create a to-do list that actually works for you. 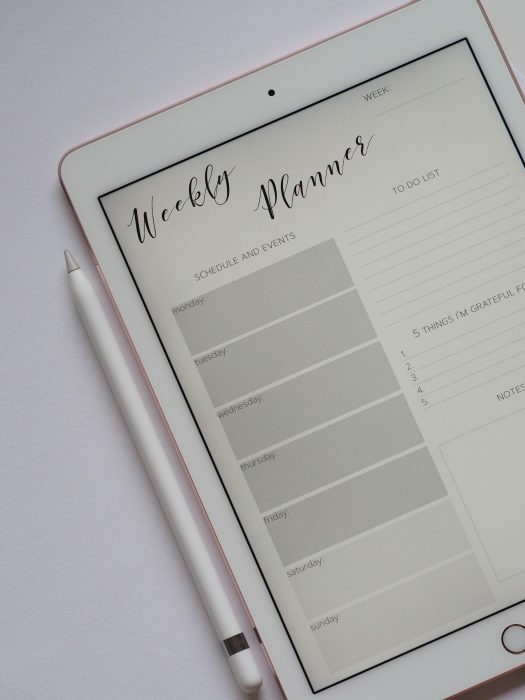 Making a to-do list that actually works not only means putting all your to-do’s in writing in one place, but it also requires prioritizing which tasks are the most important versus what tasks you would just like to do (you know, the easy ones). So many of us make lists and then never get through them, but making an effective list and learning how to use it can buy you a lot more free time, thanks to all those checkmarks hitting your list regularly. There’s an art to making an effective to-do list, but it’s an art that can be learned pretty easily. You can make a task list on paper, or you can use an app on your phone. The important thing is to pick a method and stick with it. I’ve bounced back and forth between electronic and paper, depending on the season of life I was in. I’m back to electronic now, but choose the method that works best for you. Each week, spend a few minutes writing down as many tasks for the whole week that you can think of. I like to do this on Sundays as I prepare for the week ahead. Check your calendar and note any tasks associated with events for the week. Now go through the list and cross off anything you actually don’t need to do. Cut the fluff. Maybe there are little tasks you feel like you should do, but don’t really need to do. Maybe it’s something you’ve been putting off for ages. If it’s been procrastinated on that long, perhaps it’s not actually necessary. Consider dropping it. Now you’ve got a working master task list for the week. The use of the word “no” is key because you can’t keep adding tasks to your to-do list without pushing other tasks off. If you say yes to everything everyone asks you to do, you will never be able to get to the things that are most important for you. Use the word “no” to make sure that your to-do list actually reflects your goals, not someone else’s. Once you have your master task list drafted, go back and prioritize which tasks need to be done on which day, so you can determine what your daily big rocks are. Each night, go through your to-do list for the next day and note which tasks are most important. Choose a maximum of three tasks that you absolutely must do the next day. These most important tasks are your “big rocks,” and you’ll be more efficient in tackling these tasks first before you get sidetracked doing other things. Highlight which tasks are your big rocks for the day by putting a star by the task or using a highlighter to make the task pop off the page. If you use a digital to-do list, you can bold the task or put a star on the item, if your app has that feature. We often have a habit of filling our mornings with easy little tasks that don’t really move the needle toward our goals, but for our to-do lists to truly work, we need to prioritize our tasks and hit them first thing. If I only get these three things done today, will I feel satisfied? Are these the three most important things I need to do to consider my day a success? How do you choose what to make a priority? Tasks with a deadline. Maybe you have a meeting you need to prepare for, or there’s a party at your kids’ school that you are attending. Maybe you have an assignment due at work, or there’s a baseball tournament this weekend. Any task with a deadline will need to be prioritized according to its due date. Tasks that move you closer to your goals. Dividing up big goals into smaller chunks is the best way to make sure you reach your goals. Scheduling these chunks as tasks can help move you toward your goal, so those should be a priority as well. Part of creating a to-do list that actually works is scheduling when you’re going to do those tasks. 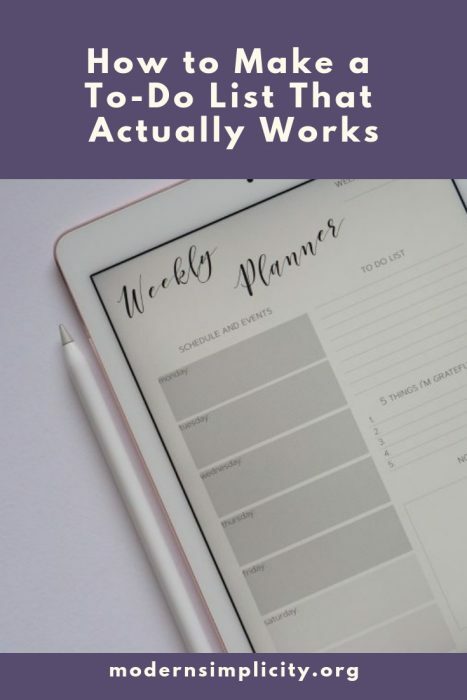 You’re not only looking at when these tasks need to be done but also at your calendar so that these things you’re saying are important to you are actually scheduled to get done. You can’t finish something if you don’t make time to work on it. Be intentional with how you schedule your time. You’re not going to have a very effective to-do list if you don’t know what you’re supposed to be doing or what supplies you need to do it. Let’s say you need to schedule a doctor’s appointment for your child. You’ve got a sticky note with the doctor’s phone number and your insurance information, but you lost the note. Pick a spot to store this information all in one place, so you know exactly where to look. Random sticky notes and little scraps of paper are bound to get misplaced, but having a single place to store that information, whether in a small notebook or a notes app in your phone, ensures you have what you need when you need it. The same principle applies to items needed for specific tasks. If you have library books to drop off, put them together in a bag by the door or in your car. If you need to pick up groceries, put all the items on one list on your phone so you don’t forget the list back on the kitchen counter. We now use Alexa for our grocery list, since we can just “tell” her what we need and she records it, then we can access the list via the Alexa app on our phones. If you need to pick up dry cleaning, put the claim receipt in your wallet. You don’t want to head out to knock a task off your to-do list only to discover you don’t have what you need. If the tasks you have to do involve some sort of materials, things you need to take with you, even a specific way you need to dress, make a note next to the task on your list so you don’t forget. When I go to a PTA meeting, I make a note on the calendar to-do that I need to have my committee binder with me. My son’s piano lessons require a certain music book. Scout functions need complete uniforms, water bottles, and sometimes books or paperwork. There are too many details that can get lost in the chaos — better to make a note so you don’t forget. Batching related tasks together on your to-do list can also save you time and energy. Take errands for example. I know I need to stop by the pet store and pick up flea treatment for my cats. I need to drop off library books. And I need to stop by my PO Box to pick up the mail. These are not things I want to do on three different days or even three different times on the same day. It’s so much more efficient to batch those errands together and do them all on one trip out if possible. Not does it help you not forget anything, but you’ll be saving time, saving energy, saving gas, and you’re being the most efficient you can be with getting those tasks done. You can also batch phone calls, paying bills, or responding to emails. Make time to do them all at once instead of randomly throughout the day. At the end of the day, you want to feel that you are making progress towards your goals and making good use of your time. Be intentional with your schedule. By planning out in advance which things are the most important, you can prioritize completing those tasks and you can feel good about the choices you made with your time. Get the free download and also receive my periodic emails with tips, tricks, and more freebies. Unsubscribe at any time. Great ideas, Sandy! I like the idea of only choosing a maximum of three tasks per day. That keeps us from feeling defeated! Batching was a great idea too. I think about that for errands, but not other things. I’m going to take a look at how to use that suggestion. Thanks, Leslie! Let me know how it works for you!